The geometry of a stream channel is controlled by both water and sediment movement, which reflect regional climate, geology , and human land use in a given drainage basin. This series of photos shows common channel geometries. 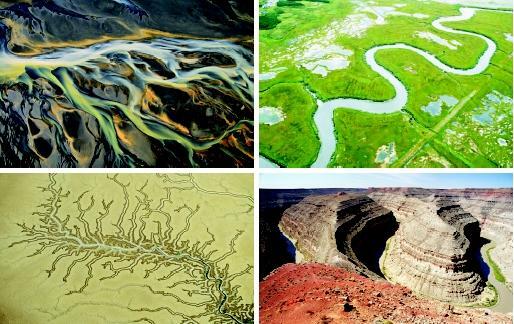 Clockwise from top left: (a) a braided portion of the Pjorsa River in Myrdalssandur, Iceland; (b) a shallow, meandering stream in New Brunswick, Canada; (c) a deeply incised meander bend (305 meters [1,000 feet] below the canyon rim) of the San Juan River in Utah (United States); and (d) the dendritic (branching) drainage network of a stream system in Kakadu National Park, Australia. moves downslope into stream channels. Some streams alternate between periods of low flow (or no flow) and sudden flash floods because the drainage basin is normally dry but occasionally receives intense thunderstorm rainfall that rushes quickly downslope as runoff. Other streams have a fairly constant discharge year-round because they are either supplied or amplified by groundwater . The sediment supplied to valley bottoms is controlled by climate and local geology, which together determine the rate of weathering that transforms bedrock into unconsolidated sediments. Sediment transport in a stream channel is controlled both by the supply of sediment from the hillslopes and valley bottom, and by the energy of flow available to transport the sediment. Depending on particle size, sediment may move as dissolved load , suspended load , or bedload . Stream channels exist in a variety of geometries. They may be braided channels with multiple flow paths that are constantly dividing and rejoining among vegetated islands or unvegetated stream bars. Braided channels have highly erodible banks and the channel may constantly shift from one side of the valley to another. In contrast to braided channels, meandering channels have a single, sinuous (winding) flow path with a series of meander bends. As water flows through each bend it moves faster along the outside of the bend and slower along the inside. The slower flow drops some of the sediment it is carrying, creating a point bar on the inside of the bend. The faster flow erodes sediment from the outside of the bend. With time, each meander bend migrates laterally toward the outside of the bend. This process would cause the channel as a whole to become more sinuous with time unless some of the meander bends are shortened by a cutoff. The process of cutoff usually occurs during a flood, when the rapidly moving mass of water takes the shortest path, cutting a new straight channel across the inside of the bend, and isolating the former meander bend as an oxbow lake. Meandering channels are thus very dynamic, with local changes in channel geometry occurring constantly. During floods, streamflow may exceed the capacity of the channel to contain it. As floodwaters spill out of the channel and across the valley bottom, the water encounters much more frictional resistance from trees and other objects. The velocity of the water decreases dramatically, and the sediment being transported is dropped onto the floodplain . Much of this sediment deposition occurs immediately beside the channel, creating linear mounds parallel to the channel called natural levees . Some sediment is deposited beyond the levees, creating a floodplain. A floodplain is the portion of the valley bottom dominated by stream processes, rather than by sediment coming directly from the hillslopes as landslides, for example. The floodplain may also be described based upon the average frequency with which it floods. Because stream channel geometry reflects water and sediment movement along the channel, any change in water discharge and sediment transport will cause a corresponding change in channel geometry. When the increased discharge of a flood brings more sediment downstream, sediment deposition may transform a meandering channel into a braided channel. Or, a flood transporting little sediment may have so much erosive energy that it dramatically erodes the stream banks and scours the streambed, enlarging the width and depth of the channel. These changes may persist for decades after the flood, or smaller flows may quickly reshape the channel to its pre-flood configuration. Human activities may alter the stream channel in either persistent or temporary ways. For example, a city government may try to stabilize the streambank next to which an apartment complex has been built by shoring up the streambank with riprap . But the next segment of channel downstream then may experience increased bank erosion as the sediment-impoverished flow leaves the riprapped channel segment. The most pervasive channel alterations are those that seek to contain floodwaters within a limited area and those that seek to increase the efficiency of both navigation and the downstream flow of water. Containment may be accomplished with artificial levees that prevent floodwaters from spreading across the floodplain; channelization that straightens and deepens a channel; retention basins that store floodwaters and release them slowly downstream; or a seawall that prevents storm surges from moving inland and upstream. The efficiency of a channel may be increased by removing obstacles to flow such as large woody debris or large boulders, or by channelization. Any change in channel form that increases the speed and energy of floodwaters may lead to severe bed and bank erosion along weaker portions of the channel, or to enhanced flooding downstream, if the channel engineering is not done in an integrated manner that accounts for downstream effects. Stream channels are dynamic systems constantly responding to natural and human-induced changes in downstream water and sediment movement. When humans attempt to manage streams, unforeseen consequences are sometimes created. Understanding the natural checks and balances that create and maintain streams will allow work to be performed in unison with those natural mechanisms, rather than against them. SEE ALSO Groundwater ; Stream Erosion and Landscape Development ; Stream Hydrology ; Weathering of Rocks. Knighton, David. Fluvial Forms and Processes: A New Perspective. London, U.K.: Arnold,1998. Ritter, Dale F., R. Craig Kochel, and Jerry R. Miller. Process Geomorphology, 4th ed.New York: McGraw-Hill, 2002. Schumm, Stanley A. The Fluvial System. New York: John Wiley & Sons, 1977.